Not necessarily. 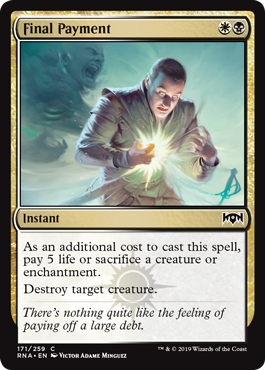 If the enchantment is Demonic Pact or that new Rakdos version of it that I still swear will never see play, I would gladly sacrifice that. I would also sacrifice 1/1 tokens, or creatures with death triggers. And life payment is always an option, possibly in a budget EDH deck. The modal cost is what makes it playable. Keep in mind, it's still bad relative to Swords to Plowshares, but in Standard? Yeah. In limited? Definitely. This is a vampires card. It works with that new enchantment, and I wouldn't be surprised if it became a good deck soon. Though, it seems terrible vs Teferi decks, so who knows. Terminate with a downside, or Terminate with an upside, depending on situation. Good way to summon forth Tom Nook.